Happy Monday! I hope everyone had a relaxing weekend. I spent both days traveling to the city for various birthday and Mother's Day parties - May is a very, very busy month in our family. I did manage to get a photo of me and my kiddos yesterday. Usually I'm at the other end of the camera so it's always a special treat. 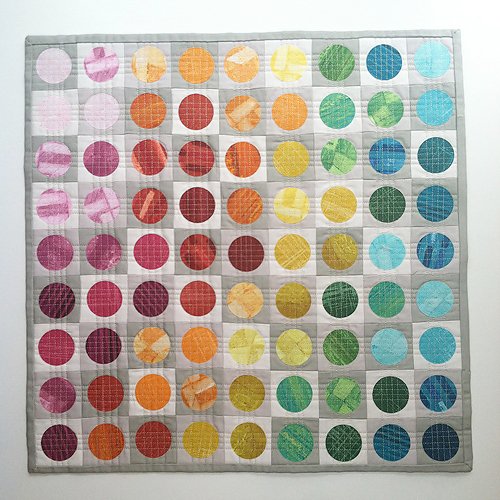 I wasn't able to spend any time at my sewing machine, but I did finish up my newest mini quilt last Friday. 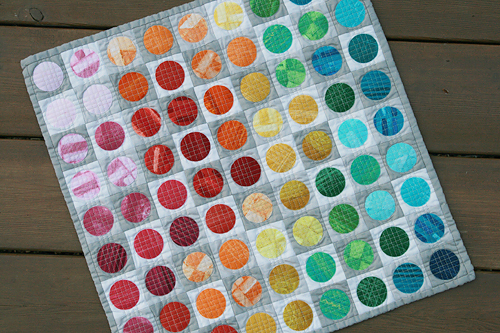 This quilt was so fun to make. Mostly because of the great fabrics from Laura Gunn. The colors are really amazing! 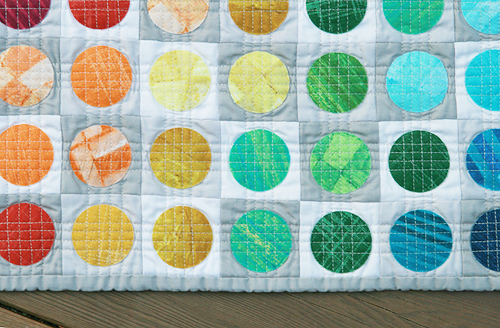 When making this quilt, I first cut my neutral squares at 2-1/2" x 2-1/2". Initially I thought this was going to be a pillow, so I set it up to finish at 18" x 18". This means there are 9 squares across and 9 squares down (for a total of 81). 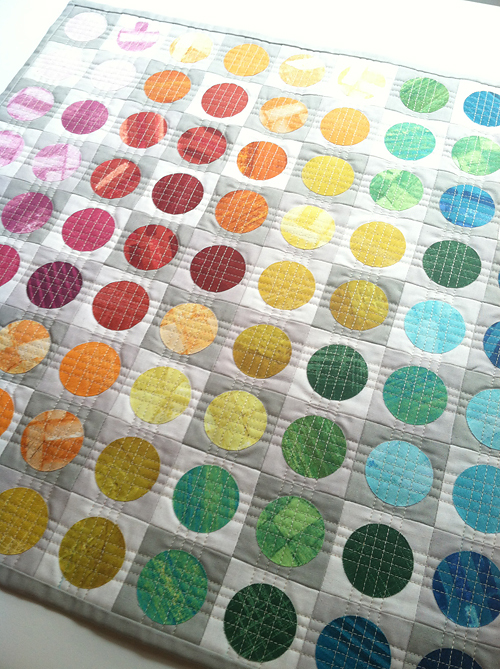 I pieced those together first, and then created my quilt sandwich for quilting. The neutral fabrics I used are all Free Spirit Designer Solids - Pearl, Sand Dune and Dogwood. After that was all set up, I started placing out my circles until I came up with a layout that I liked. 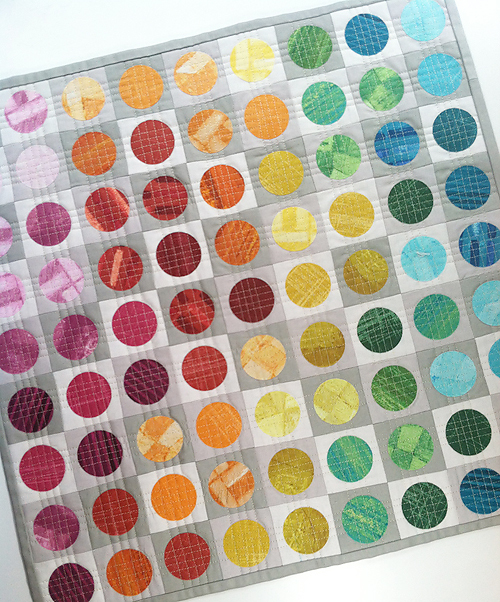 I used Heat n Bond Lite to fuse the circles to the squares. After I was done ironing everything into place, I did the quilting. I'm not sure if this is a weird order to go about the process, but I thought it would be fun/smart to combine the applique and quilting steps. (As opposed to appliqueing the circles onto the squares, and then sewing them together, creating the quilt sandwich, and quilting). At first I started just going around the edge of each circle, but after one row I changed my mind and decided on something a little different. So I ripped out those stitches and started quilting 4 straight lines through the middle of each row and column. Just something a bit unexpected. From the beginning, when I was thinking about this project, I envisioned raw edges fraying in the finished quilt. I've washed it a couple times now and it's only now starting to fray a little. I think I need to throw it back in a couple more times. I'm really enjoying the texture it's creating. This week I'm hoping to sit down and do some design work, and also get back to work on my Simply Style work in progress. Finger's crossed!